Organization types do not classify your organization; you use them for reporting purposes only. The type may identify the function an organization performs, such as Administration or Service, or the level of each organization in your enterprise, such as Division, Department or Cost Center. Examples of external organizations that may require entry are disability organizations, benefits carriers, insurance carriers, organizations that employees name as beneficiaries of certain employee benefits, and organizations that are recipients of third party payments from employees' pay. 6. Then save your work. As we are defining an Inventory Organization, we will choose the classification name as Inventory Organization. Then mark the enabled checkbox and then save your work. Here, we need to attach the Ledger, Legal Entity and Operating Unit. Enter the details and select Ok, again in next window Ok. This will ask for a confirmation, select Yes. Then again from the Others button, select Inventory Information. 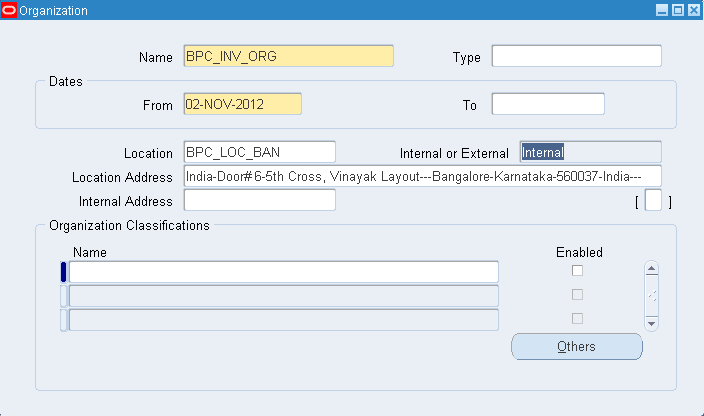 This will pop up the Organization Parameters window. 1. 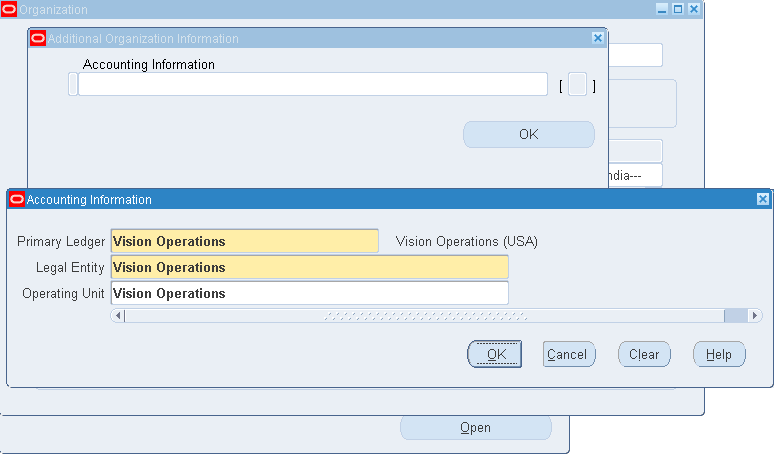 Enter an organization code for which you want to set up the organization parameter. 2. Select an Item Master organization. Oracle Inventory only defines items in the Item Master organization of the organization from which you enter the Items window. 3. Select a workday calendar. 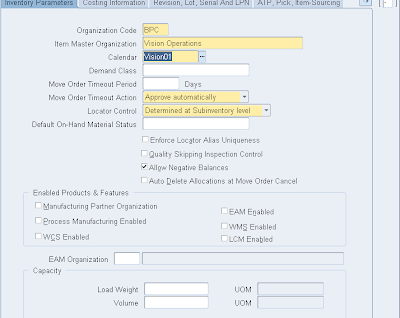 This is required when Oracle Master Scheduling/MRP and Oracle Supply Chain Planning is installed. 4. Optionally, select a demand class. Demand classes segregate scheduled demand and production into groups, allowing you to track and consume those groups independently. 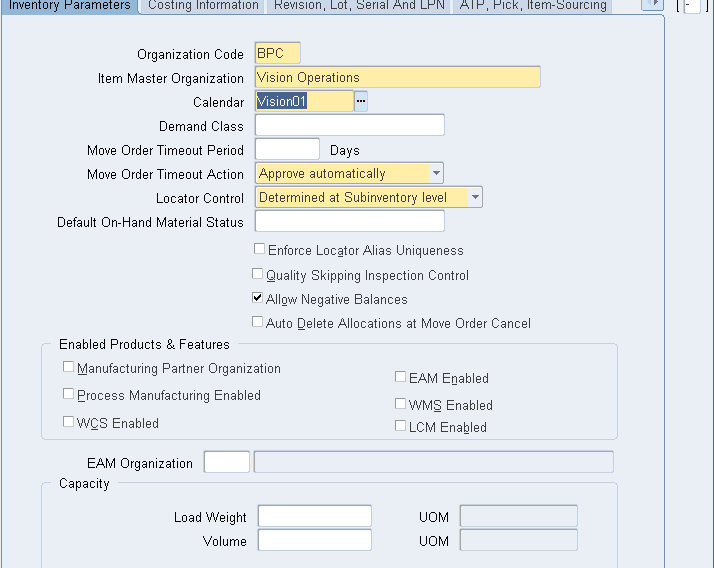 Oracle Master Scheduling/MRP and Oracle Supply Chain Planning uses this demand class during forecast consumption, and shipment and production relief. 5. In the Move Order Timeout Period field, enter the number of days a move order requisition can wait for approval. The workflow approval process sends a notification to the item planner when a move order requisition requires approval. After the first timeout period, if the recipient has not approved or rejected the order, a reminder notice is sent. After the second timeout period, the order is automatically approved or rejected, depending on whether you select Approve automatically or Reject automatically in the Move Order Timeout Action field. 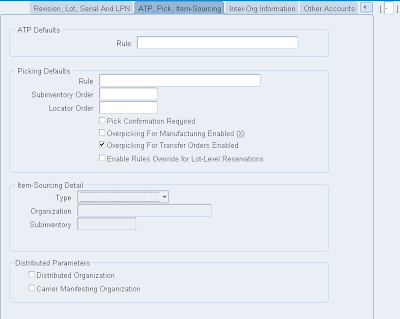 If you want to bypass the move order approval process and automatically approve move order requisitions, enter 0 days in the Move Order Timeout Period field and select Approve automatically in the Move Order Timeout Action field. Approve automatically: After the second timeout period, move order requisitions are automatically approved. 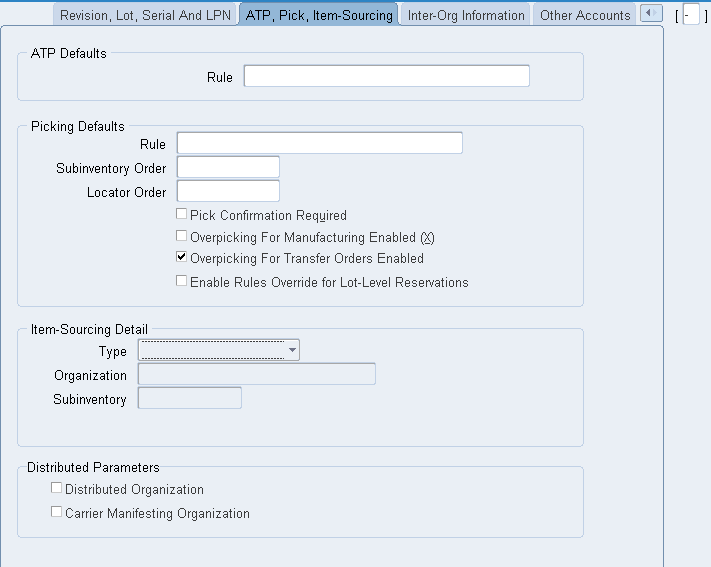 Select this option and set the Move Order Timeout Period to 0 if you want to bypass the move order approval process and automatically approve move order requisitions. Reject automatically: After the second timeout period, move order requisitions are automatically rejected. None: Inventory transactions within this organization do not require locator information. Prespecified only: Inventory transactions within this organization require a valid, predefined locator for each item. Dynamic entry allowed: Inventory transactions within this organization require a locator for each item. You can choose a valid, predefined locator, or define a locator dynamically at the time of transaction. Determined at subinventory level: Inventory transactions use locator control information that you define at the subinventory level. Indicate whether to allow negative balances. Determines whether inventory transactions can drive the inventory balance of an item negative. 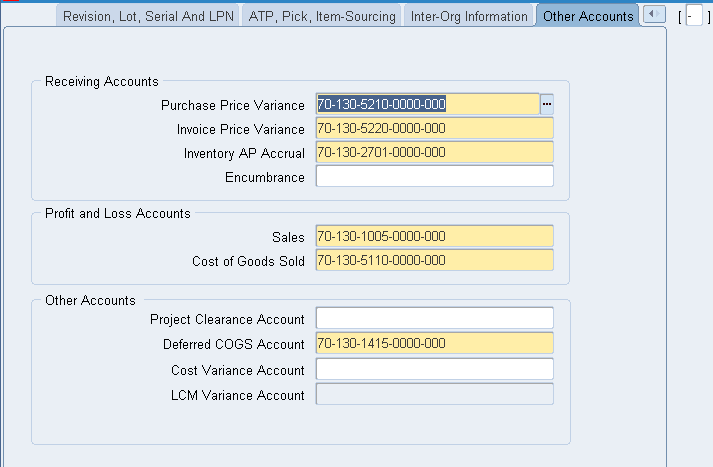 Attention: If insufficient quantity on hand exists in a supply subinventory to satisfy backflush demand, Oracle Work in Process forces the supply subinventory balance negative, ignoring this option setting. groups in this organization. Locator control must be enabled in order to enable WMS. Once this has been enabled and transactions have been entered in this organization, this box cannot be unchecked. Indicate whether this organization is enabled for Quality inspection. Indicate whether this organization is an Oracle Enterprise Asset Management enabled Organization. Enter a total load weight and unit of measure for this organization. Enter a total volume and unit of measure for this organization. 8. Select a Default On-hand Material Status tracking option. This step is optional. 3. 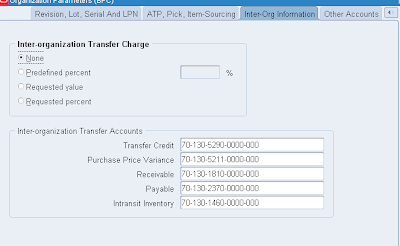 Transfer to GL Indicate whether all transactions are posted in detail to the general ledger. Caution: Transferring detail transaction distributions to the general ledger increases general ledger posting times due to the number of records created. 4. Reverse Encumbrance Indicate whether to reverse encumbrance entry upon receipt in inventory. You normally select this option if you use encumbrances with Oracle Purchasing. If you leave this field blank, all available transactions will be costed,as usual. If you enter a date, all transactions prior to this date will be costed. All transactions on or later than this date will not be costed. 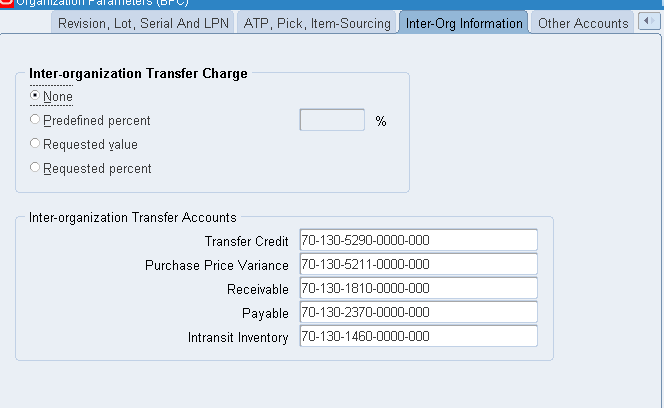 For inter–organization transfers, a standard costing, receiving organization will not cost a receipt if the sending organization did not already cost the transaction. The default time is the first instant of the date. You can optionally choose another time. The standard cost update process can be performed on the cost cutoff date. You can restart cost processing by changing the cutoff date to blank, or a future date. 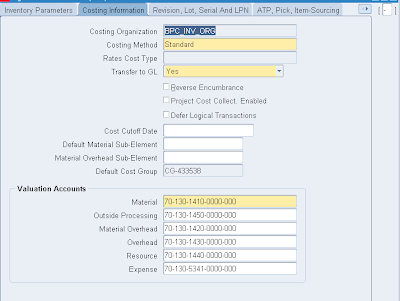 For standard costing, select a material sub–element that this organization uses as a default when you define item costs. For average costing, the default material sub–element you select can be used for cost collection when Project Cost Collection Enabled is set. Optionally, select a Default Material Overhead Sub–Element from the list of values. During the Supply Chain Rollup process, when costs are merged from another organization, markup and shipping costs will use this value. The supply chain cost rollup will complete successfully, regardless of whether this field is populated. If the Cost Rollup identifies an organization with a default material overhead sub–element not set up, a corresponding warning message will be printed in the log file. 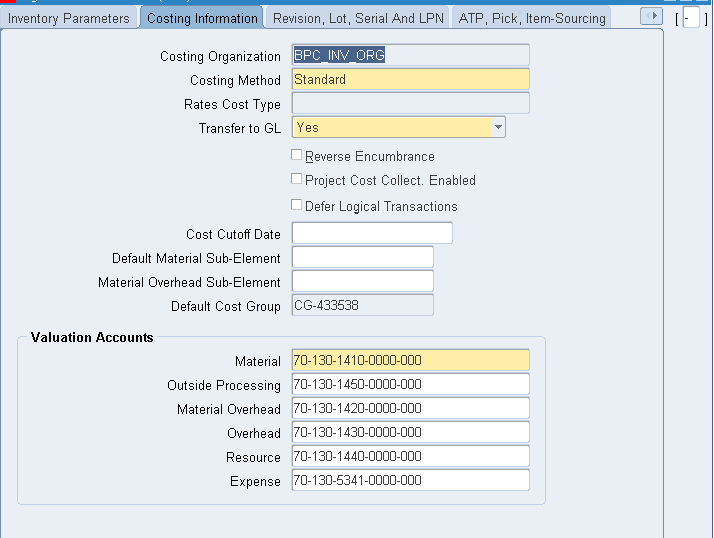 Indicate the default cost group for the organization. This will default into the Default Cost Group field for each subinventory. If the WMS cost group rules engine fails to find a cost group, this cost group will be used. and intransit values. Once you perform transactions, you cannot change this account. Expense The expense account used when tracking a non–asset item. Purchase Price Variance : The variance account used to record differences between purchase order price and standard cost. This account is not used with the average cost method. Invoice Price Variance : The variance account used to record differences between purchase order price and invoice price. This account is used by Accounts Payable to record invoice price variance. Inventory A/P Accrual : The liability account that represents all inventory purchase order receipts not matched in Accounts Payable, such as the uninvoiced receipts account. Project Clearance Account: When performing miscellaneous issues to capital projects, the project clearance account is used to post the distributions. Deferred COGS Account: This account is used by the Sales Order Issue transaction type to deferred COGS until AR recognizes revenue. Cost Variance Account: Under average costing with negative quantity balances, this account represents the inventory valuation error caused by issuing your inventory before your receipts. Landed Cost Management (LCM) variance account: This account is used by the new Landed Cost Management module. Enter a starting revision to be the default for each new item. 1. Select an option for lot number uniqueness. Across items: Enforce unique lot numbers for items across all organizations. 2. Select an option for lot number generation. 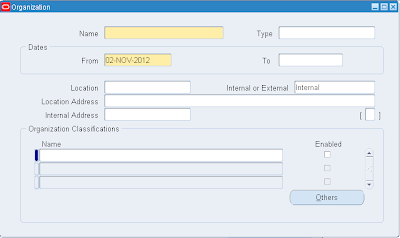 User–defined: Enter user–defined lot numbers when you receive items. At organization level: Define the starting prefix and lot number information for items using the values you enter in the Prefix, Zero Pad Suffix, and Total Length fields. When you receive items, this information is used to automatically generate lot numbers for your items. At item level: Define the starting lot number prefix and the starting lot number when you define the item. This information is used to generate a lot number for the item when it is received. 3. Indicate whether to add zeroes to right–justify the numeric portion of lot numbers (Zero Pad Suffix). 4. 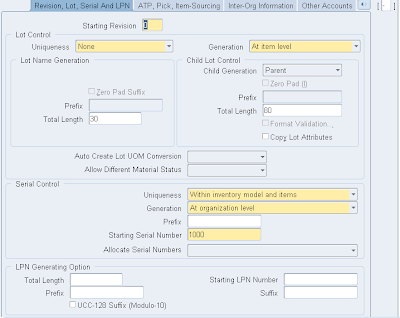 Optionally, select an alphanumeric lot number prefix to use for system–generated lot numbers when generation is at the organization level. 5. Optionally, define the maximum length for lot numbers. If you use Oracle Work in Process and you set the WIP parameter to default the lot number based on inventory rules, then WIP validates the length of the lot number against the length you define in this field. 1. Select an option for serial number uniqueness. 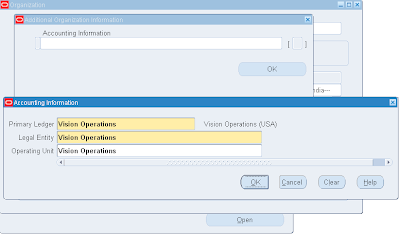 Within organization: Enforce unique serial numbers within the current organization. 2. 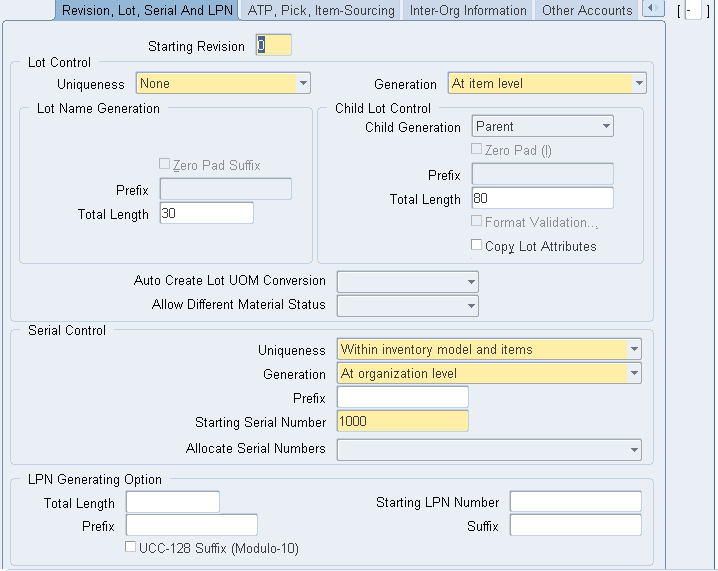 Select an option for serial number generation. 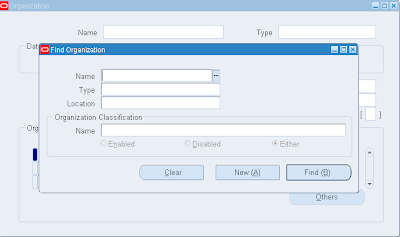 At organization level: Define the starting prefix and serial number information for items using the information you enter in the following fields of this window. At item level: Define the starting serial number prefix and the starting serial number when you define the item. 3. Optionally, select an alphanumeric serial number prefix to use for system–generated serial numbers when generation is at the organization level. 4. Optionally, enter a starting serial number to use for system–generated serial numbers. If serial number generation is at the organization level you must enter a starting serial number. 5. Indicate whether the system will suggest serial numbers as part of the move order line allocating process. If you do not select this option, you must manually enter the serial numbers in order to transact the move order. Select a default ATP rule. Management, the default is the ATP rule for the Master organization. Select a default picking rule. Notes: This rule will not be employed in a WMS enabled organization. The WMS picking rules will be used. Enter a default subinventory picking order. This value indicates the priority with which you pick items from a subinventory, relative to another subinventory, in which a given item resides. The value you enter here displays as the default when you define a subinventory. Enter a default locator picking order. This value indicates the priority with which you pick items from a locator, relative to another locator, where a given item resides. 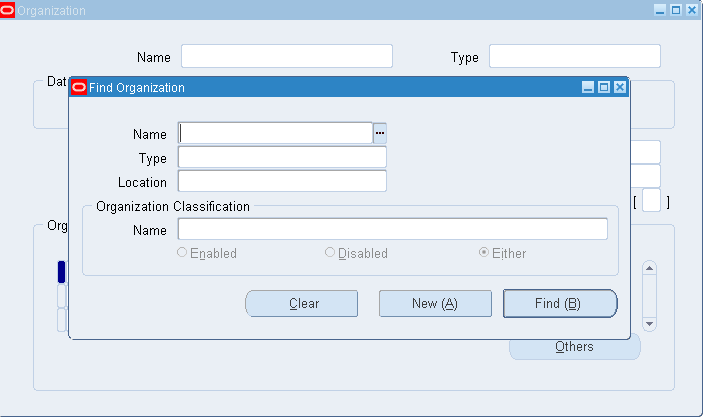 The value you enter here displays as the default when you define a locator. Check the Pick Confirmation Required box if you want your pickers to manually pick confirm. If you do not check the box, pick confirmation will occur automatically. Select a source type for item replenishment. Inventory: Replenish items internally from another subinventory in the same organization or another organization. None: No default source for item replenishment. Select the organization used to replenish items. 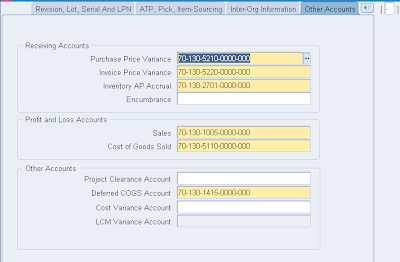 You must enter a value in this field if you selected Inventory in the Type field. Select the subinventory used to replenish items. 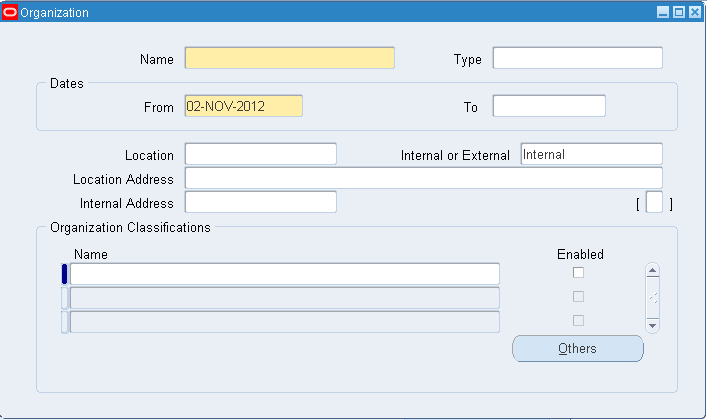 You must enter a value in this field if you selected your current organization in the Organization field. 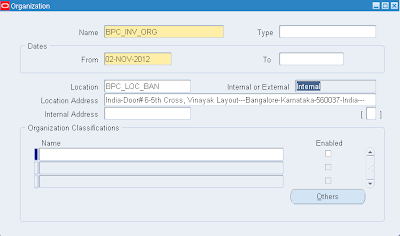 You cannot enter a value in this field if you selected Supplier in the Type field.